First year student Daniel Bull this year’s winner of the Research & Writing Skills (RWS) oral competition. Students on the RWS module are presented with a problem scenario revolving around the construction of a new hall of residence on campus and are asked to advise the client (the University’s Vice-Chancellor, Sir David Bell) on Contract or Tort law implications. 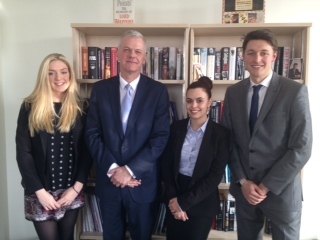 Daniel, alongside runner-up Elizabeth Smith and finalist Rayana El Baba, made an oral presentation to Sir David of the advice contained in their Part A legal letters and responded to questions posed by the client. Both Sir David Bell and RWS Module Convenor Dr Amy Codling were extremely impressed with the professional attitude of both the competition finalists at this early stage in their legal career. Due to the success of this (and the previous) year’s competition it is hoped that future students will continue participate in this exciting opportunity.